Durable in-ground basketball goal designed for rugged, high-intensity play. 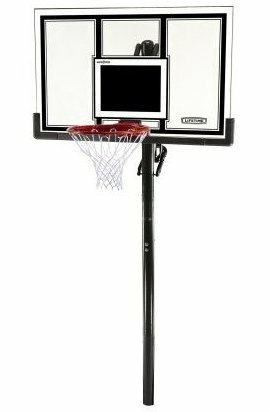 54-inch pro-look backboard made of sturdy Makrolon polycarbonate for shatter-proof action. Power Lift pole raises or lowers rim from 7-1/2 to 10 feet in infinite increments. Slam-It Pro Rim with double-compression springs for dunking; all-weather nylon net. Blow-molded backboard frame for protection; fixes in ground with cement; 5-year warranty.